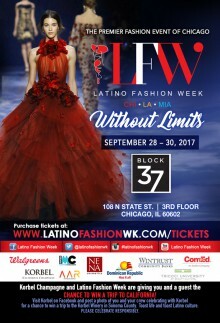 Don’t miss the arrival of the 11th year anniversary for Latino Fashion Week® Chicago – “Without Limits”. Join the LFW movement during the 3-day celebration of Chicago’s fashion. Day One will feature the collections of local and national designers presenting their most stunning styles and dynamic designs. Day One also features LFW’s very own Celebrity Catwalk! 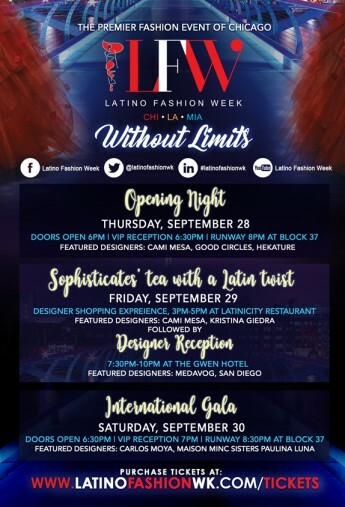 The VIP reception, included with the Opening Night preferred ticket, will feature local retaurants and chefs.